Bernice Liu is Dating Hunky “Infernal Affairs” Co-star, Kevin Chu? After her failed relationships with Hawick Lau (劉愷威) and Moses Chan (陳豪), 39-year-old Bernice Liu (廖碧兒) concentrated on developing her career in recent years. However, she was spotted going on a date with her 29-year-old co-star from Infernal Affairs <無間道>, Kevin Chu (朱鑑然). From selling wine and opening her first bar to getting into the processed foods business, Bernice expanded her wealth aggressively. Although she was rumored to have been dating a wealthy businessman in those years, Bernice denied the reports and stated that she was single. With her business ventures firmly established, Bernice had a bit more time to concentrate on her personal life. 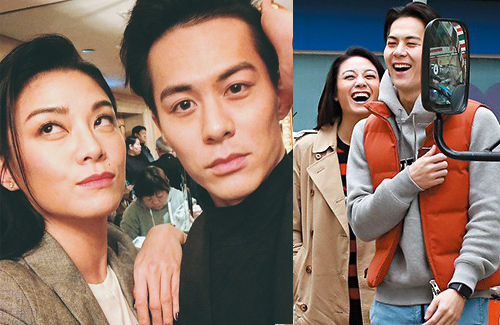 Growing close with Kevin, after working together in web-drama Infernal Affairs, Bernice was recently seen at a Mongkok flower market with the actor. Despite Kevin being 10 years Bernice’s junior, the two chatted happily and did not bother hiding their closeness when they spotted reporters. With Kevin carrying a pot of lovely flowers, Bernice even held onto the actor’s elbows to steer him away from the paparazzi. A former competitive swimmer in Hong Kong, Kevin attended the University of British Columbia. During his college years, Kevin worked as a model and developed an interest in the entertainment industry. After a cameo role in Dante Lam‘s (林超贤) To the Fore <破風>, Kevin started to receive more acting offers. Kevin’s role as a triad and also Damian Lau‘s (劉松仁) illegitimate son in Infernal Affairs was very eye-catching. Since the drama was already released in Mainland China last year, Kevin’s fans have grown significantly. 1 comment to Bernice Liu is Dating Hunky “Infernal Affairs” Co-star, Kevin Chu? don’t know much on him but had to google him, quite impressive body lol … hope this time Bernice will finally get the love she deserved if they are indeed dating.